Sleep is crucial to maintain a healthy lifestyle. 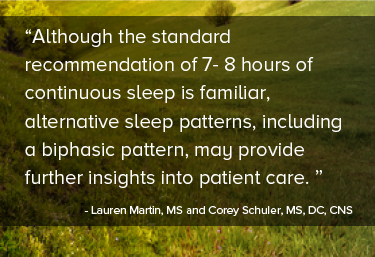 Although the standard recommendation of 7- 8 hours of continuous sleep is familiar, alternative sleep patterns, including a biphasic pattern, may provide further insights into patient care. Interestingly, history shows that biphasic sleep patterns may not be as uncommon as we think. Evidence suggests that biphasic sleep patterns have been practiced for centuries; however, there is limited research on the long-term effects of biphasic sleep compared to monophasic sleep. While limited, this evidence and the historical use of alternative sleeping patterns may be informative for integrative practitioners. When a patient notes that he or she awakes in the middle of the night, we may instead explore the healthfulness for this individual rather than using tools to override what may be their natural or behavior-derived pattern. The art of practice extends to exploration of these novel and alternative concepts in addition to standard recommendations. 3. Bahammam AS, Sharif MM, Spence DW, Pandi-Perumal SR. Sleep architecture of consolidated and split sleep due to the dawn (Fajr) prayer among Muslims and its impact on daytime sleepiness. Annals of Thoracic Medicine. Jan 2012;7(1):36-41. 5. Arnulf I, Brion A, Pottier M, Golmard JL. Ring the bell for Matins: circadian adaptation to split sleep by cloistered monks and nuns. Chronobiology International. Dec 2011;28(10):930-941.